We pride ourselves on providing high quality design drawings and specifications. All the details for your new garden are defined clearly for you and for the landscaper to bring to reality. We enjoy meeting our commitments and communicating well with our clients throughout the design process. After our first meeting, we come back at an agreed time to survey the site and start the work to develop the design. This involves measuring the entire site and locating all existing features, trees and plants which are to be retained or removed. 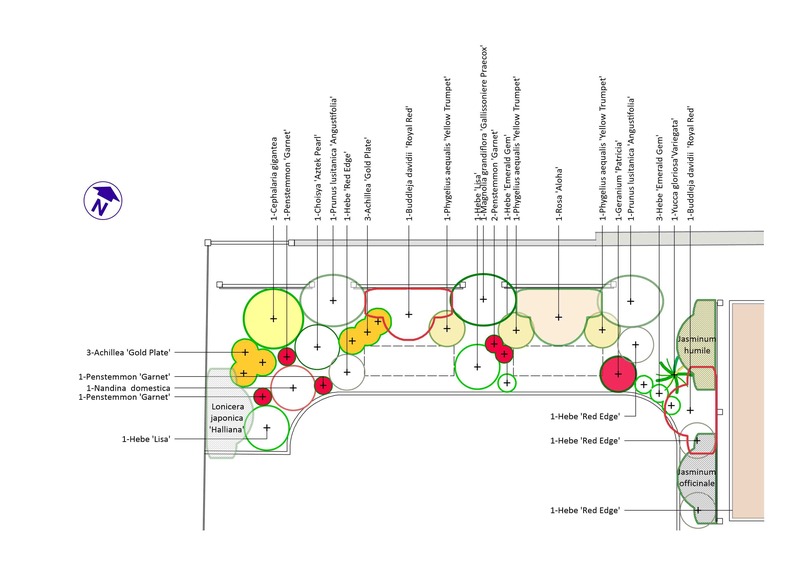 A Survey Plan scale drawing is then prepared which notes the dimensions, aspect, boundaries, levels, soil conditions and other important information for the design. Our landscape garden designer, Siobán, now has a good feel of what you would like and the site itself. She then prepares the design concept, illustrated with images to show the style, and an outline plan with the functional areas of the garden. This is the most creative part of the process where ideas come together to provide the design foundation. Siobán will meet with you again to check that the concept meets your approval before proceeding to prepare detailed drawings. This is developed from the agreed outline plan. 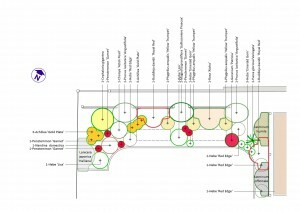 It shows all the features and the areas for plants, lawn and paving. It includes a set of notes explaining the detail of features such as walls and ponds, sculptures etc. These drawings show the construction of steps, screens, pergolas, ponds and other features and are prepared for the landscaper to use. This important document is provided to specify all the materials and requirements for the work in accordance with best landscaping practice. This helps you get the required quality of implementation from qualified and experienced landscapers. This is a plan view looking down on the arrangement of all the plants in the borders. Each set of plants is identified with the Latin name and the correct spacing for planting. It is accompanied by a list of plants which shows the number of trees and plants of each type and their maintenance requirements. If you would like, the common names of plants can be added to this. We produce the documents above as standard. They can be added to and adjusted to suit your specific needs.